This class caters to toddlers from 36 months who cannot swim but are ‘preparing’ for independence from their parent/guardian in the water. The aim of this class is to teach children the fundamentals of swimming with special emphasis placed on following instructions (wait, listen, share) along with floating, dominant movement patterns, pop up breathing and self-rescue. Classes run on Monday and Wednesday mornings at 9:15am. Ratio 4:1 with parents ready and willing to hop in the water if necessary. Cost: $16 per lesson payable at the beginning of each term (including school holidays). Preparation classes are transferrable to our Level 1 class upon graduation. 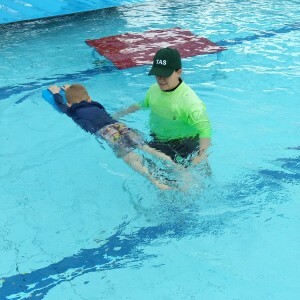 This class caters to children who cannot swim but who are old enough to be in the water without a parent or guardian. The aim of this class is to teach children the fundamentals of swimming with special emphasis placed on correct body position in the water both on the front and back, correct breathing with head turn in Freestyle along with introduction to dives and streamlining from the wall. Classes run on Monday, Tuesday, Wednesday, Friday afternoons at 3:30pm. Cost: $16 per lesson payable at the beginning of each term (including school holidays). This class is for swimmers who have correct Freestyle and Backstroke and who are able to swim short distances with or without correct breathing. This level focuses on establishing correct balance in the long-axis strokes of Freestyle and Backstroke. Specific attention on Freestyle correct head turn, breathing timing and swimming on the side is given. Breaststroke kick is introduced along with further development of Streamlining from the wall and standing dives. Classes run on Monday, Tuesday, Wednesday and Friday afternoons at 4:00pm. This class is open to swimmers who can complete a minimum of 15 metres correct Freestyle and Backstroke. The aim of this level is to build resilience into the swimming with focus on establishing sound and efficient technique in Freestyle and Backstroke. The concepts of timing, balance and rhythm are reinforced. Breaststroke kick is further developed and underwater streamlining, Dolphin kick, breakout strokes, zip drill for Freestyle and Racing dives are introduced. Classes run on Monday, Tuesday, Wednesday, Friday afternoons at 4:00pm. This is a mini-squad. In order to qualify for this level, swimmers must be able to complete 25 metres of Freestyle with correct breathing and Backstroke and must possess a correct Breaststroke kick. The Advanced Learn to Swim class is designed to bridge the gap between Learn to Swim and Squads. Instructors spend time in and out of water, allowing them to continue with stroke correction while allowing swimmers to experience receiving instruction from the pool deck. Freestyle and backstroke drills are taught and swimmers are introduced to full Breaststroke and Butterfly. Dive starts are further developed and swimmers are extended from 25m swims to 50m swims. Classes run on Monday, Wednesday, Friday afternoons at 3:30pm. There are many reasons why some adults have not yet learned to swim. From lack of opportunity as a child, to fear of the water from previous experiences, to just never having gotten around to it. Some adults have had swimming lessons as children, but never continued on with developing their abilities in the pool. 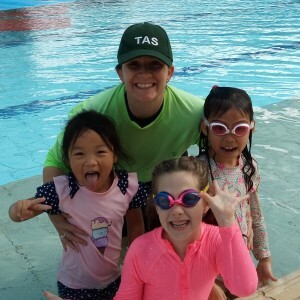 Whatever the reason, TAS Aquatic Centre is offering Learn to Swim for adults in a safe, secure, private pool with teachers focussed on helping you achieve your own goals. Whether you want to swim an event or just feel confident with your children at the beach or local public pool, our programs are designed to help you feel confident in the water. Learning how to float, breathe, move and re-gain your feet is our priority to give you the confidence to increase your swimming ability. It’s never too late to learn how to swim! Book now and start your swimming journey here with us. Classes run on Friday afternoons at 4:45pm.